Radio Active #3 is finally available for download. I’d finished most of the production last week, and foolishly thought I’d be able to work on it over the weekend. Why I thought this–given that my daughter’s birthday party was Saturday, and Easter was Sunday–I have no idea. This time around I eschew the soundclips and focus on the words (mainly because GarageBand didn’t want to import them, and I didn’t want to fight with it). I spend a fair amount of time talking about comic books — what I read, what I do with them after I read them, frustrations with Marvel’s and DC’s web sites — before taking a detour into a story about my gaming group’s notorious “Great Salsa Incident”. I also discuss the podcasts I like (something of a recap for regular NT readers, but there’s some new stuff) and round it out with some thoughts on being a Geezer Gamer. 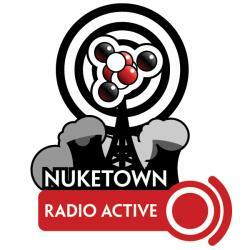 In a change from the last two shows, I’ve decided to include my show notes with the announcement on Nuketown, which should streamline things a bit. I’ve also changed the audio settings, cutting the size of the file by 2/3. I think the audio quality is still acceptable, but let me know. Listening to Neil Gorman from Comicology talking about the difference between comic readers and collectors. I’ve always considered myself to be both, but I’ve got to admit … I’m becoming a bad comic geek. In high school, I treated my comics with a great deal of love and respect. I read most of them seated at my desk, and after finishing each one, I bagged it and filed it away in a box. I entered it in my paper record noting all the comics I had, and even experimented with a computerized record system. Now, well, not so much. Don’t feel too bad about this, because DC Comics and Marvel are slacking off too, and comic books are their job. Tried to sign up for the DC newsletter and was told “This newsletter is not available to you at this time”. What the hell does that mean? No indication of why I was rejected based. Astonishing X-Men by Joss Whedon / Marvel Comics. His sharp, quick dialogue translates well to the comic format, and bodes well for his Firefly comic book coming out this summer. Plus, he brought back Colossus, who had one of the most idiotic deaths in the history of comics. Nice, gritty comic that says true to Robert E. Howard’s vision. Some stories are adaptations of existing short stories (like the God in the Bowl), others are new. Superman/Batman. While the last few issues haven’t been as great as the earlier ones, I love the mental back and forth between these two characters, which explores their friendship, their beliefs, and their own assessments of each others shortcomings. Just listened to Dragon Page Winging It #3 and Mur Laffrety’s piece on gaming food. She offers her thoughts on the best food for different games. It brings to mind some advice of my own (based on my campaign) which is to keep salsa far away from gaming table!